With tides that reach up to 16.5 metres (54 feet), it is a spectacular natural phenomenon that occurs nowhere else on the planet. The power of nature is everywhere around the Bay of Fundy and Annapolis Valley, with rocky shores, broad mud flats, and populations of whales, migrating shore birds and other marine life. Nova Scotia is famous for it’s many species of whales that can be seen not far off the coast. In this region you can take several whale watching tours off Digby Neck, kayak the Nova Scotia coastline, try some world famous Digby Scallops or simply enjoy watching the high tides along Canada’s famous Bay of Fundy. The Bay of Fundy area is also rich in Canadian history. Some 400 years ago, early settlers established their forts, farms and fishing villages along this picturesque coast and in the fertile Annapolis Valley. The Annapolis Valley is home to the Nova Scotia wine region, famous apple orchards, farmers markets and hosts some of the most popular Nova Scotia food and wine festivals. Wine tasting tours are popular in this area and several of Canada’s award winning wines are made locally. 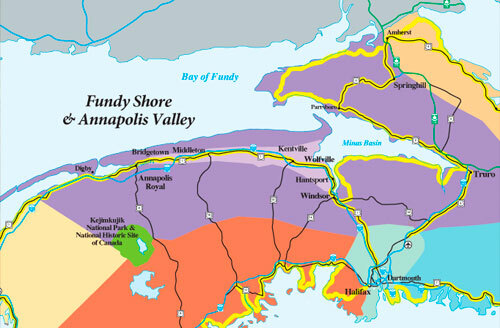 The links below will help you plan your Bay of Fundy Shore and Annapolis Valley Nova Scotia adventure.